Power Plate Therapy uses Acceleration Training to stimulate the body’s natural response to vibration. These vibrations transmit waves of energy throughout your body, which activate muscle contractions between 25 and 50 times per second. Acceleration Training on the Power Plate offers you benefits such as improved Muscle strength, balance, flexibility, bone density, mobility and blood circulation. The Power Plate benefits increase lymphatic drainage critical to detoxification and eliminating cellulite, while increasing the release of key hormones that enhances the look and condition of your skin and increases your metabolic rate to expedite weight loss. Research has proved the reduction of muscle pain and soreness, while expediting the recovery of damaged muscles and tendons. The Power Plate is used to treat sciatica and painful arthritic joints and neurological conditions such as Parkinson’s disease, Cerebral Palsy and Multiple Sclerosis. Healthcare professionals have also had success in reducing pain, increasing activity levels and elevating mood in Fibromyalgia patients with the Power Plate. It is also used to combat osteoporosis and balance problems in elderly patients as well. 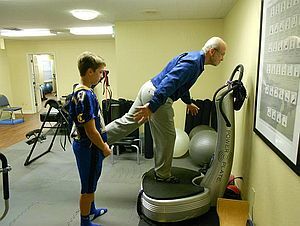 You don’t have to be a world class athlete to benefit from using Power Plate machines. There are health benefits for everyone, regardless of your age and current fitness levels, such as increasing your metabolism, increasing your bone mineral density, reduction of the stress hormone cortisol, elevation of Human Growth Hormone and improved lymphatic flow. Power Plate machines help your body in all these ways with little impact on joints and ligaments. Power Plate therapy is proven to reduce muscle pain, reduce soreness and accelerate the recovery of damaged muscles and tendons. Power Plate machines are great for people who don’t have time for a long work-out three or more times a week. Acceleration Training exercise using Power Plate machines offers you important benefits that will help fitness goals easily be achieved or exceeded. These benefits range from an immediate improvement in blood circulation, to a variety of other measurable outcomes, such as increased muscle strength and flexibility, better range of motion, better core conditioning and stability, and faster recovery. Please call us at The Rubin Health Center in St Petersburg FL at (727) 822-1555 to schedule a personal training session on the Power Plate.